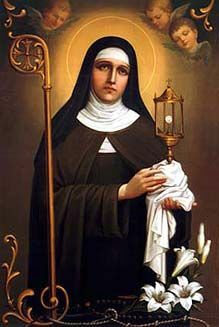 Together with her mentor and friend, Francis of Assisi, St. Clare shook the foundations of Medieval society by revolutionizing religious expression. Her given name, Chiara means clarity and we call on St. Clare whenever we need to shine a light on a situation or to find a way to communicate more clearly. She is also invoked to protect the blind and to help those with eye trouble. Chiara Offreduccio, as the beautiful daughter of minor royalty was offered every worldly advantage available to one in her social class. When she heard St. Francis preach the Lenten service at her church in 1212, his simple message of living with complete trust in God inspired her to abandon going through with her arranged marriage in order to join the Franciscan movement. The first followers of Saint Francis were the wealthy sons of his town of Assisi. Their act of turning their backs on the material world to live at the mercy of the elements and on whatever alms they could beg was disturbing and controversial to both their families as well as to the church authorities. Attracted by the joyous way in which they comported themselves, as well as the enthusiasm they brought to religious worship, Clare was the first woman to join their order. Fervently believing in a life devoted to the precepts of the gospel, the Franciscans did not believe in personal property. When Clare escaped her family to join them on Palm Sunday, Francis himself cut off her long blond hair and handed her the simple woolen robe worn by his followers. He then left her in the local Benedictine convent as there were no facilities in his order for women. It was not long before her entire family attempted an intervention type rescue of the girl. Revealing her shorn hair to her horrified father made them realize that she would never return to their world. Her younger sister, as well as other wellborn young women from the town soon followed her. 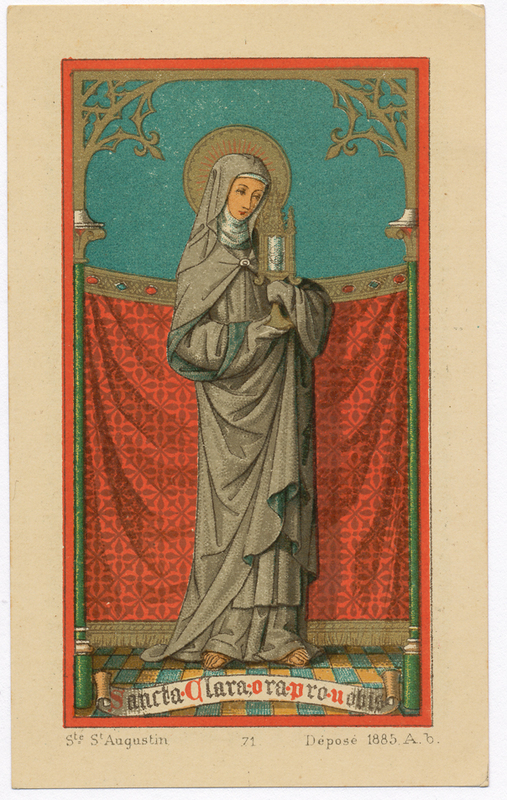 In 1215, Saint Francis installed Clare as the Abbess of the Order of Poor Ladies. True to the Rule of St. Francis, they accepted no dowries from their families as other religious orders did. When they were left inheritances, the money was distributed to the poor. Highly intelligent, and known for the efficacy of her prayers, popes, cardinals, royalty and St. Francis himself came to her for spiritual advice. Her own correspondence shows her to be a clever, happy person. Monstrance: Devoted to the Eucharist, Clare protected her convent by holding up a monstrance, which holds the host. Sometimes in art, this monstrance is re-interpreted as a lamp. Since Chiara means clarity, it is Clare shining the light of clarity. O Glorious St. Clare! God has given you the power of working miracles continually, and the favor of answering the prayers of those who invoke your assistance in misfortune, anxiety, and distress. We beseech you, obtain from Jesus through Mary His Blessed Mother, what we beg of you so fervently and hopefully, (mention your petition) if it be for the greater honor and glory of God and for the good of our souls. Amen. Willing to give up the comforts of her privileged life in order to obtain a state of enlightenment, Saint Lucy is one of the early virgin martyrs who challenged the authority of the Roman state. Her very name means ‘light’ and as light is direct and clear, shining in the most filthy of environments, we invoke her for clarity of vision in the spiritual as well as the physical realm. Born in Syracuse, Sicily to a wealthy family of Greek descent, Lucy’s father died when she was very young. Following the traditions of their society, Lucy had a large dowry and was affianced in an arranged marriage to a pagan nobleman. Lucy was a Christian and believed that she could best be a conduit of the Holy Spirit by remaining a virgin unfettered by husband and children. At this time Christianity was a great threat to the Roman Empire and the emperor Diocletian vowed to stamp it out wherever it arose. Lucy kept her vow a secret as Christians were considered revolutionaries against the state. 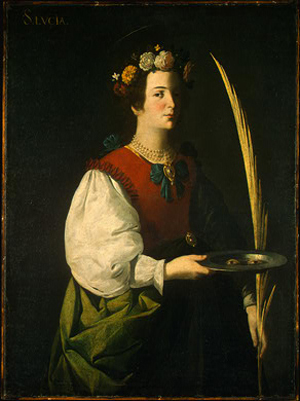 Since her mother suffered from constant bleeding from a uterine hemorrhage, Lucy took her to the tomb of Saint Agatha in Catania, a place where many miracles were reported, for a healing. While spending the night there, Lucy dreamt of Saint Agatha who told her, “You have no need to invoke me, for your faith has already cured your mother. One day you will be known as the patron of your own city.” Upon awakening and finding her mother completely healed, Lucy confessed to her desire to remain a virgin and distribute her dowry among the poor. Impressed by her faith, her mother acquiesced to her daughter’s wishes. When her fiancé heard of the broken engagement he went to the governor to denounce Lucy as a Christian. In an attempt to change her mind, she was brought before the authorities. When she asked why was it so important that this man need to marry her, she was told because she had the loveliest eyes. Whereupon Lucy ripped out her eyeballs and told the governor to send them to her former fiancé. The next day her eyesight was miraculously restored and Lucy was once again brought before the authorities. An attempt was made to have her taken to a brothel to be repeatedly raped, but a phalanx of soldiers could not move her. A team of oxen was brought in to no avail. Burning pitch was poured on her head, but she stood fast, predicting the downfall of the emperor. This last declaration proved to be too much and Lucy was fatally stabbed in the throat. True to her prophecy Diocletian the emperor abdicated his throne within the year. It is said that “the longest of nights and shortest of days belong to Saint Lucy.” Because her feast day, December 13 used to be the winter solstice before the change to the Gregorian calendar, Lucy enjoys great patronage in Scandanavia as the saint who brings the coming of the light. Her relics were moved to Venice where she is celebrated in song by gondoliers. In Sicily she is credited with ending an epidemic of children’s deaths in the 14th century, today she is synonymous with Santa Claus, where children receive gifts on her feast day. When there was a famine in her native land during the 16th century, ships laden with raw wheat turned up on her feast day. The starving inhabitants cooked the wheat whole, and today it is customary to cook with raw wheat on her feast day. Eyes on a dish: Lucy ripped out her own eyes and offered them to her fiancée when she was told he loved her for her beautiful eyes. She was not in need of her mortal eyes as she was filled with light. (Excerpted from the app: “Novena:Praying with the Saints” by Barbara Calamari and Sandra DiPasqua).